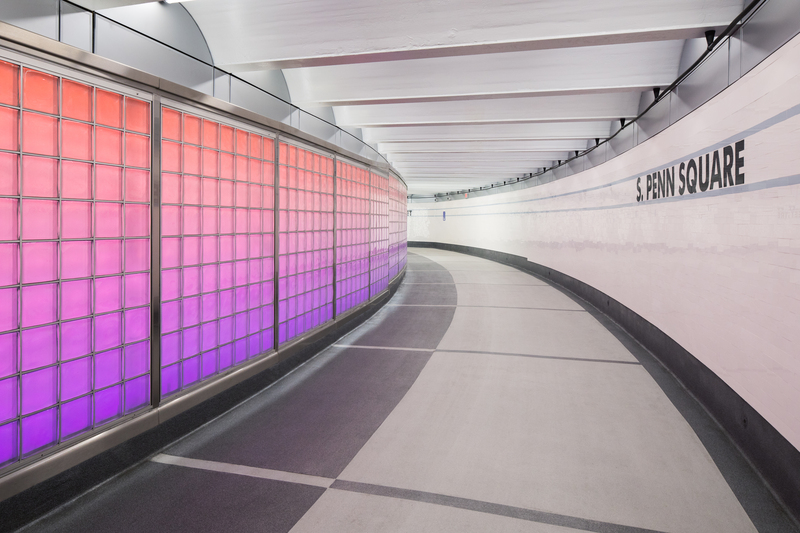 This summer, the Southeastern Pennsylvania Transportation Authority (SEPTA) completed the first phase of the Downtown Link, its Center City concourse improvement program to upgrade the underground pedestrian tunnel network. Significant architectural enhancements were made during this phase including an innovative, backlit, glass block "active" wall system by Exterior Technologies, Inc. (EXTECH). The multi-phased, $59.65 million, Downtown Link improvement program seeks to address some of the Pennsylvania transit system's most pressing needs in its vital Center City pedestrian concourse. During the program's first phase, contractors are making structural repairs, remediating leaks, replacing lighting fixtures and escalators, upgrading elevators, improving security and enhancing architectural components. The Downtown Link connects six subway stations, two regional rail systems, and provides access to many businesses, offices, historical points of interest and other destinations. This public space comprises more than 500,000 square foot space stretching from JFK Boulevard to Spruce Street and from 8th Street to 18th Street. "Originally built in the early 1900s, renovations over the years resulted in a piecemeal mismatch of materials. Nothing is straight; there are no right angles," said Kevin Rockey, R.A., project leader with Sowinski Sullivan Architects. He explained, "In addition to addressing the areas in need of the most repair, SEPTA saw this as an opportunity to re-image the concourse as a destination unto itself. It can be disorienting underground and you can lose track of your geographical place. Within the concourse, we created an episodic experience of events for the passengers and public as they moved through the paths and corridors. We envisioned active and passive walls along their journey would help in connecting them to the streets above and directing them to their location." Rockey describes the passive walls as simple white tile and the active wall as a series of inter-changeable modules. The active wall includes EXTECH's custom-engineered and fabricated glass block system that, in concert with the static white and color changing lights, simulated movement and transparency. A minimal amount of exposed metal framing was specified for EXTECH's system to maximize the glass surface area and to blend with the concourse's existing, mortared glass block walls. "The glass block wall is the common thread throughout the concourse," Rockey continued. "Where possible, in later phases, we plan to retain the existing glass block walls and use them to our advantage by retaining and restoring them as cost effectively as possible. Where this was not possible or practical, the new system is being used." Behind EXTECH's customized glass block grid system programmable LEDs generate the desired appearance and control. This also is where the conduit that previously was exposed and mounted to the corridor ceilings was re-routed, housed and secured. Planning for future services, extra room remains in the space concealed by the active wall's glass block. SEPTA's Engineering, Maintenance and Construction department also required the glass block system to comply with impact resistance, graffiti resistance, vibration resistance and maintenance requirements. In addition, the glass block wall sections would need to vary in size and placement, with some spanning full corridors and others integrating between maps and signage. "It may surprise most people to know that it was the maintenance requirements that posed the greatest challenge," said EXTECH Director of Product Application and Development Kevin Smith, R.A. "Designing a durable, vandal-proof wall system that can be easily removed for inspection and maintenance is not a simple task. 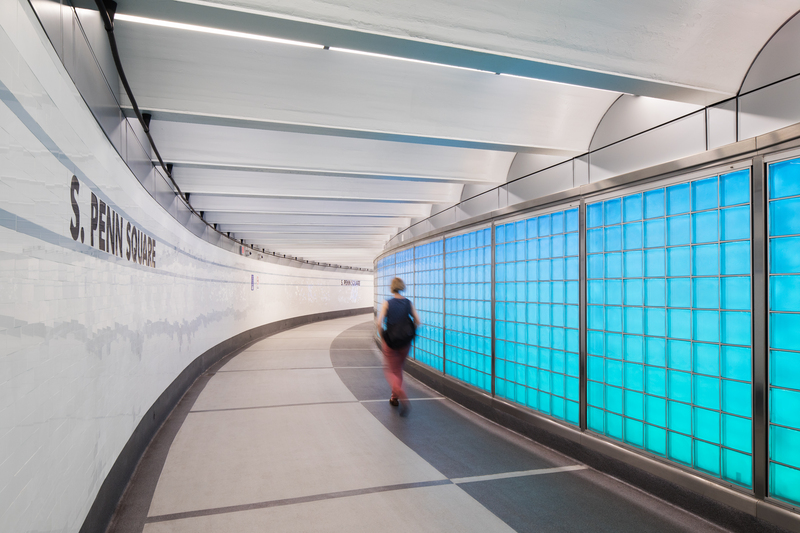 Consider most subway concourses are constructed with poured-in-place concrete, granite, tile and porcelain panels – which are difficult, at best, in allowing access behind them." Successfully achieving SEPTA's and Sowinski Sullivan's numerous criteria, EXTECH's engineers developed a 1.5-inch glass block, joggled-set, modular system arranged in vertical panels with a narrow aluminum frame along the top and bottom. Up to seven vertical panels, each at 7 feet tall by 8 inches wide, are interconnected within a wall section. Smith explained, "The 'joggle-set' system allows one person to easily unlock a wall section and remove a vertical panel to gain access behind the glass block. Each vertical panel weighs approximately 70 pounds, which a qualified person can safely lift. Fabricated as a dry-glaze system, there also are no wet seals or caulking to mess with when either removing or reinstalling the glass block vertical panel." DHC Construction, Inc., the glass block wall system's installers, also appreciated the straightforward installation to coordinate with SEPTA's phased construction improvements. "Because of its consistent size and appearance, the modular system layout also can be changed," added Rockey. "It is an evolving, living installation and a successful project." 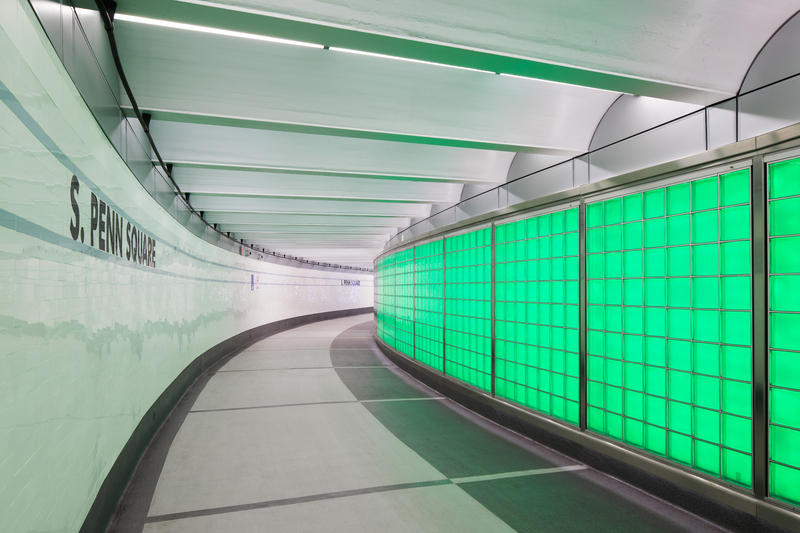 "It's a completely custom solution and met all of SEPTA's needs," said Smith, who has engineered daylighting and façade solutions for subway facilities since 2005. As part of EXTECH, he and the company draw from more than 40 years of experience delivering systems for the transit industry. "We are well-versed in the assorted requirements and demands of transit structures, and transit regulations. Our systems are built to help transportation authorities meet their bottom lines and boost ridership. Our products serve exterior and interior needs, and they offer the durability, vandal-resistance, easy maintenance, long lifespan, and so much more that is vital to transit facilities," described Smith. Along with custom-engineered systems, EXTECH's standard transportation-focused systems include: CLEANWALL® porcelain wall panels; GRIDLOCK® and MATRIXWALL® glass block walls; KINETICWALL® dynamic façades; SKYGARD 3300 and 3700® skylights; SKYSHADE 3100, 3700 and 8000® canopies; and TECHVENT 5300® windows for transit shelters, pedestrian walkways, protective windscreens, and parking structures. All of EXTECH's systems are manufactured in Pittsburgh and are compliant with the "Buy American" mandates Fixing America's Surface Transportation (FAST). For more information on EXTECH's products and services, please call 800-500-8083, email info@extechinc.com or visit https://EXTECHinc.com.